YSU Provost Martin Abraham, left, and Professor Li Jinsong of Chengdu sign the agreement in Tod Hall at YSU. 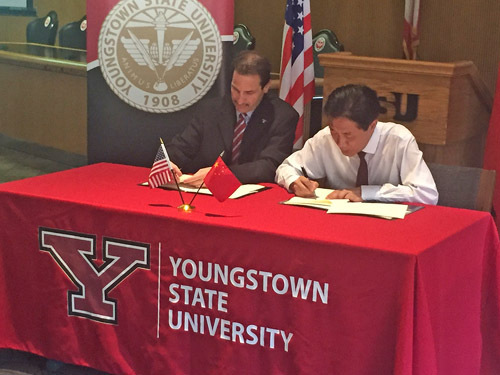 Students at Chengdu Technology University in China will be able to study Engineering at Youngstown State University under an agreement signed this morning at YSU. “The working relationship between Chengdu and YSU has the potential to increase the internationalization of YSU in terms of international student enrollment as well as faculty mobility between China and the United States,” said Nathan Myers, YSU associate provost of International and Global Initiatives. The signing of the Undergraduate Pathway Agreement took place in the Board of Trustees meeting room in Tod Hall on the YSU campus. The agreement, which will allow students studying Engineering at Chengdu to transfer seamlessly to YSU after two years of study in China, is a follow-up to a visit that a delegation of YSU officials made to Chengdu last fall. The visit, which included YSU provost Martin Abraham, featured the signing of general agreement that established a framework for further cooperation. Members of the Chengdu delegation visiting YSU are: Professor Li Jinsong, party secretary; Professor Li Gangjun, director of the School of Mechanical Engineering; and Yang Ni, International Office administrator. For more information, visit the YSU Center for International Studies and Programs.